You may not know it, but if you watch TV, you’ve likely seen a film by Providence Pictures. We are an award-winning film and video production company specializing in documentaries on science, history, art, and culture. Our programs air worldwide and consistently earn critical acclaim and high ratings. Through stunning photography, powerful narrative, inventive animation, and cinematic re-enactment, Providence Pictures documentaries translate complicated ideas into simple, compelling stories. Providence Pictures is seeking interns to assist in the research and development stages of new projects and those currently in production, developing and implementing new internet/social media strategies, and general production assistance. Candidates should be creative, energetic, and interested in contributing to the development of documentary based work. The more you put in, the more you get out. Innovation and fresh ideas are our most valuable resource. Whatever your idea, be it a graphic style, line of research, organizational technique, anything at all … we encourage you to bounce it around. Mac proficiency is required. Some background and interest in archaeology, history, religion, environment science, or evolutionary biology would be helpful. Internships run for a minimum of one semester with a minimum commitment of 8 hours of work per week that can be done in two, four hour time blocks, or one eight hour day. This is a non-paying position. We are currently working on 3 one-hour films for the PBS series NOVA: Secrets of the Colosseum, The Unshakeable Hagia Sophia, and The Lost City of Petra. We are also looking for interns interested in developing possible projects on the Statue of Liberty, Egyptian Antiquities, and Pre-Columbian America. 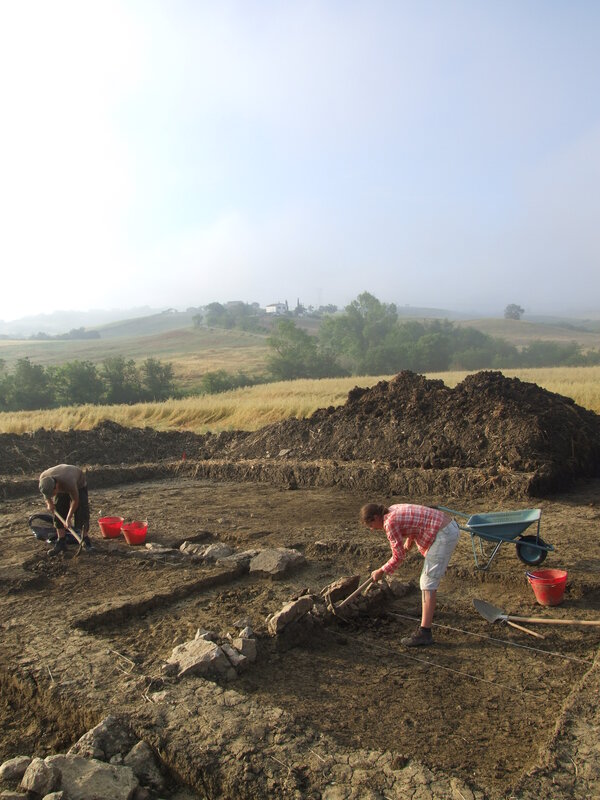 Since 2009, the Roman Peasant Project, has run a ground-breaking series of excavations on the lives of the rural poor. The first every systematic attempt to excavate and analyze the diet, architecture and lifeways of Roman peasants, the Project has exploded many the assumptions we have held about poverty, Roman agriculture and economies. The Project is accepting applications for a limited number of spots for its 2015 field season, in which we’ll be excavating a small Roman farm. You’ll be trained in rescue-excavation methodology, hand and digital documentation and environmental material processing. Logistics: Accommodation is in a local school; all meals provided. Participants need only provide their own transportation to Grosetto on June 8. Weekends free. We are excited to invite abstracts for our session at the Theoretical Archaeology Group (US) meeting 2014, which takes place 23-25 May 2014 at the University of Illinois at Urbana-Champaign (https://www.regonline.com/builder/site/Default.aspx?EventID=1195202). DEADLINE EXTENDED TO 21 MARCH 2014. This panel invites papers that consider archaeology as the convergence of temporalities — that is, archaeology as memory, constantly interpreted and reinterpreted. How does the archaeologist cope with the palimpsest of matter and signification constituted by material remains? Suggested topics include: methods of preservation and presentation of archaeological heritage; object life-cycles and their implications for archaeological interpretation; and the influence of contemporary events on the interpretation of the past. Send abstracts of 300 words or less by March 21 to dearmond@stanford.edu and meganjd@stanford.edu. For Olivier, archaeology deals with a constantly shifting palimpsest of material snapshots layered over by memories, altered realities and the context of our own vantage point in the present. Thus, rather than recovering and representing the past in a unilinear, sequential and historicist fashion, the archaeologist, like the psychoanalyst, engages in the arduous process of teasing out tangled memories to uncover the meanings of things past. These memories are themselves interpretations of the past, kept alive through their continual transformation in the present. The archaeologist, then, deals not so much with history as with memory and its persistent, present and necessary reinterpretation. the influence of contemporary events on the interpretation of the past. Session notes: We invite 4-5 papers, 20 minutes in duration, that engage with this central question. We anticipate a 10-minute Q&A period to follow each of the papers, followed by a 30-minute period for remarks by a final discussant and open group discussion. The Department of History of Art and Architecture and the Joukowsky Institute for Archaeology and the Ancient World at Brown University invite applications for a visiting assistant professor position in any field of ancient art, architecture and archaeology. Teaching will be at both the undergraduate and graduate levels; interdisciplinary offerings are desirable. Candidates must be engaged with a promising and developing research program; the Ph.D. must be in hand by July 2014. Excellence in undergraduate and graduate teaching is essential. The successful candidate will also be expected to take a full part in the academic life and to contribute to the ongoing development of both units. This will be a one-year position with possibility of renewal for a second year, beginning on July 1, 2014. All candidates should submit a letter of application and a curriculum vitae by April 15, 2014. Applicants should arrange for three letters of reference to be submitted by the application deadline. Applications received by April 15, 2014 will receive full consideration, but the search will remain open until the position is closed or filled. Please submit application materials online at apply.interfolio.com/24529. The Joukowsky Institute for Archaeology and the Ancient World at Brown University invites applications from exceptional junior scholars who have demonstrated a capacity for innovative research and cross-disciplinary thinking. We seek candidates who best augment or complement the present strengths of the Joukowsky Institute community. We are particularly interested in individuals working in four spheres: 1) visual culture; 2) archaeologies of gender; 3) public archaeology; 4) the archaeology and art of the ancient Asian world. In addition to pursuing their research, successful candidates will be expected to teach half time — i.e., one course per semester. Teaching may be at both the undergraduate and graduate levels; interdisciplinary offerings are desirable. Applicants must normally have received their Ph.D. from an institution other than Brown within the last five years. Successful candidates will be expected to make substantive contributions to the ongoing development of the Joukowsky Institute for Archaeology and the Ancient World, such as the organization of reading or working groups, a topical symposium, or another project intended to foster a stimulating intellectual environment in which to pursue research and to develop new interdisciplinary connections. This will be a one-year position, with the possibility of a one-year renewal, beginning on August 1, 2014. All candidates should submit a letter of application, short descriptions of 3-4 proposed courses, and curriculum vitae by March 31, 2014. Applicants should arrange for three letters of reference to be submitted by the application deadline. Applications received by March 31, 2014 will receive full consideration, but the search will remain open until the position is closed or filled. Please submit application materials online at apply.interfolio.com/24429.